Hailing from a small provincial town in south Vermont, Sam Amidon grew up in a family of traditional folk musicians who have made a life out of performing a wide range of music from the American folklore and teaching old New England stories and songs. Having left his native state and moved to New York, Sam took his musical roots with him, performing old songs, bringing them up to date by creating modern acoustic arrangements. He eventually released his first album, But This Chicken Proved Falsehearted, in 2007. After joining the ranks of the ever excellent Bedroom Community, Sam recorded All Is Well, his second album, with a number of Icelandic musicians, including Valgeir Sigurðsson. The album also saw contributions from Bedroom Community regulars Ben Frost and Nico Muhly, while Sam’s younger brother Stefan played drums on a couple of tracks. Since, Sam has contributed to his fellow label mates’ releases, especially Nico Muhly’s Mothertongue album, for which he provided vocals and played banjo and guitar on The Only Tune, a piece adapted from a disturbing folk song about two sisters that Muhly’s parents used to sing to him as a child. Right from the opening moments of How Come That Blood, it is clear that I See The Sign is a much more elaborate affair than its predecessor. 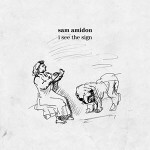 With intricate percussions, a rounded moog and plucked strings creating a busy backdrop for Amidon’s vocals, this song indicates quite a drastic change from the delicate acoustic textures of All Is Well, but, like on that album, Sam delivers his songs, for the most part ancient forgotten tunes, with great restraint and elegance, his wonderfully smoky voice, fluid and fragile, bringing subtle nuances to the melodies, while his guitar and banjo remain at the heart of his performance throughout. Once again, Nico Muhly provides particularly effective arrangements for strings, brass and woodwinds, creating beautiful frames from the songs to develop, especially on Way Go Lily, I See The Sign or Relief, while Amidon’s long term friend and multi-instrumentist Shahzad Ismally plays a wide range of instruments throughout, with additional contributions from Ben Frost on electric guitar Valgeir Sigurðsson on bass, percussions and electronics. Joining Sam on vocal duties on four of the songs is English folk/pop singer Beth Orton, their voices working particularly well on You Better Mind and Relief, a superb orchestral folk reworking of a song originally sung by R Kelly. But, while this album offers a much more expensive sound than its predecessor, there are still moments where vocals and acoustic guitar are key. This is very much the case on Johanna The Row-di and Climbing High Mountains, on which a lone English horn provides delicate motifs in the background, while a lightly plucked acoustic guitar resonates just below Sam’s voice, or on the melancholic Rain And Snow, while on Pretty Fair Damsel, Amidon on acoustic guitar and Muhly on piano create a particularly stunning and vibrant piece as they elegantly circle around each other’s melodic lines. With this new album, Sam Amidon continues to pay homage to a forgotten chapter of the American Songbook and brings these songs back to life by giving them a contemporary slant. The lavish production doesn’t actually detract from the natural beauty of these songs, if anything, it accentuates it in parts. These is very much to Amidon’s credit, whose profound understanding of the genre and of the legacy of these songs greatly contributes to making this album wonderfully timeless.